You may have noticed that broad, beautiful swath of green on the maps next to Bear Mountain Resort in Moonridge. 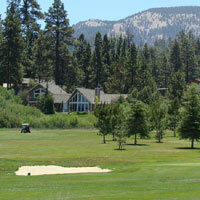 Yes, it’s the Big Bear golf course, a stunning location where you can play nine beautiful holes at 7000 feet. According to the course gurus golfing in Big Bear means that in the thin atmosphere your ball will soar like a bald eagle. Just don’t hit one -- a bald eagle, that is. The Big Bear Mountain Golf Course is located in the town of Moonridge just at the base of the Bear Mountain Ski Resort. The course is a 9-hole regulation length golf course. The short layout of the holes has 3 tee boxes for fun, but challenging golf game. Yes... the ball does fly further at 7,000 ft. elevation. The mountain-style Bear Mountain Golf Course provides a tranquil atmosphere for players of all abilities and is complete with a pro shop, Bear Trap restaurant, golf club and cart rentals. Come play in mild summer temperatures, the surrounding fragrant pine trees and blue skies for a relaxing golf game. The course is 9 holes, 2,730 yds. and is a Par 35. Also at the course if the Club House Grill which overlooks the 9th hole. The restaurant serves a variety of great salads, sandwiches and burgers for lunch. The hours of operations vary throughout the summer season. Very popular is the driving range where you can getaway for just a short time and hit some balls. It is a great couple of hours when the family is off doing their thing... and Dad, needs some time to himself! This 300-yard driving range is located on the north end of the golf course. The range hut can be seen from Club View Drive and parking is available off to the side of the street near the sixth fairway. Driving range hours fluctuate with the seasonal changes.